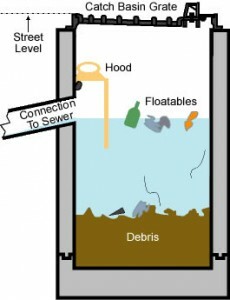 A catch basin allows rainwater collected on the streets to flow through underground pipes leading to sewer system. With a grate on top, a catch basin filters large debris from the road, ensuring that only water and smaller rubbish could fit through the slots. As an integral part of a municipal sewer system, the catch basin prevents roads from flooding. However, the catch basin itself could become clogged. A blocked catch basin is not effective in trapping debris and allowing water to flow freely through the drainpipes. Leaves, plastic and other objects could be stuck inside the basin, blocking off the passage of the water from roads. Since the catch basin is used very often, it has to be cleaned regularly. Otherwise, it wouldn’t be able to serve its original function. 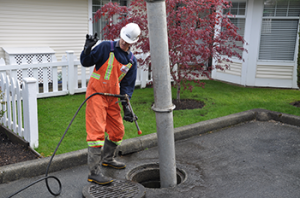 An annual inspection should be done to see if the catch basin needs cleaning. One way of knowing whether the basin should be cleaned is by looking at how much deposit has accumulated at the bottom. 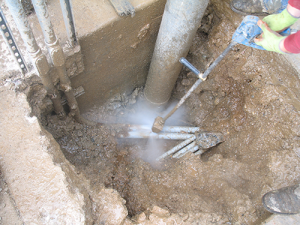 If the accumulated dirt is more than one-third the depth of the basin, then the catch basin needs to be cleaned. However, a weekly cleanup is required if trash has already found its way at the bottom of the basin. The cleaning can be done either manually or by using an equipment. Vacuum pumps pull out the deposits, which are eventually disposed in landfills. Before the debris are thrown, a chemical analysis must first be conducted to check whether the hazardous waste is still within the EPA criteria. The analysis will dictate how the waste should be discarded. 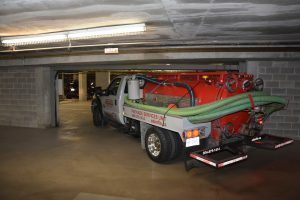 This entry was posted in Catch Basin Cleaning and tagged catch basin benefits, Catch basin cleaning, catch basin services, catch basin servicing, edenflo pump truck services, edenflo services, Storm drain cleaning, Storm sumps on November 1, 2012 by Edenflo.